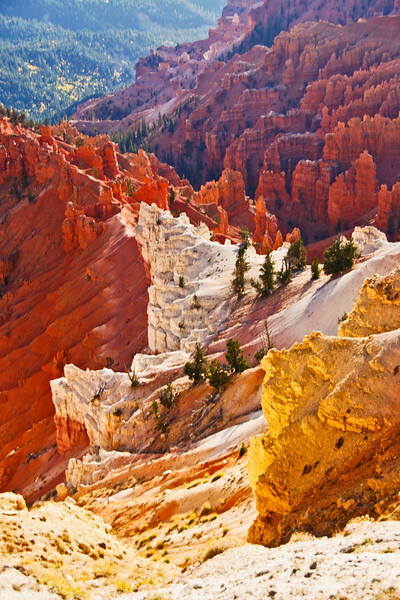 Cedar Breaks resembles a miniature Bryce Canyon. The Indians called Cedar Breaks the "Circle of Painted Cliffs." Situated at an elevation of 10,000 feet, Cedar Breaks is shaped like a giant coliseum dropping 2,000 feet to its floor. Millions of years of uplift and erosion have carved the huge amphitheater. Deep inside are stone spires, hoodoos, columns, arches, pinnacles, and intricate canyons in varying shades of red, yellow and purple. The best views are from the Spectra Point/Ramparts Trail - a four-mile round-trip along the rim, with spectacular views in all directions.